When US President Donald Trump visits China, one subject high on the agenda will be the sweeping trade investigation of Chinese policies that he ordered in August. The White House said it would probe practices that encourage the theft of intellectual property from US businesses - a long-simmering source of tension in the US, Europe and elsewhere. The Chinese government has said the inquiry was a "serious concern" and has warned that it will not sit back if the US takes actions it deems unfair. But one of the biggest challenges for Mr Trump's investigation comes from his own country. Since the White House started its inquiry, a slew of US business groups have submitted formal comments describing their concerns. But just six companies have proved willing to come forward with complaints, according to the public record of comments. Many of them are smaller businesses describing already known incidents. Analysts say companies are hesitant to put at risk their access to one of the world's biggest markets by speaking out. But the decision to stay quiet has consequences: it is likely to limit the administration's ability to build a strong case against China. It may hurt the ability to identify effective remedies, while also making unilateral action more appealing to the White House. "It's going to be a huge problem that companies are unwilling to provide specifics because it's going to be very difficult for the United States government to take effective action," says Lee Branstetter, a professor of economics and public policy at Carnegie Mellon University. The White House's focus on intellectual property theft in China follows years of concerns in the US, Europe and elsewhere over counterfeit goods, piracy, hacking, patent violations and other forms of theft. The Commission on the Theft of American Intellectual Property estimates that the annual cost to the US economy from counterfeit goods, pirated software and theft of trade secrets is between $225bn and $600bn. In recent years, the US says the Chinese government has encouraged some of those practices as part of its economic and national security strategies. Those involve state-backed enterprises and are focused on boosting certain industries such as aerospace, robotics and biotech. The US inquiry asked for information about topics including policies that pressure companies to share information with local business partners; opaque approval processes; and possible cyber espionage backed by the government. But previous US efforts to tackle the issue have been hindered by the hesitance of major companies to speak out, says Phil Levy, senior fellow at the Chicago Council on Global Affairs. "This has been the problem," says Mr Levy, who served as a trade economist under former President George W Bush. "If you want to say China has these violations and we are acting in response to that... you need to have that fairly well documented. And to do that you need to have the co-operation of the companies involved." Edwin Rogers is co-founder of Bonumose Biochem, a small Virginia-based start-up that was one of the six companies that shared its complaints. In his case, he says scientists in China filed a copycat patent for a process of making a healthy rare sugar - technology that he believes his company had purchased rights to after acquiring a firm last year. The scientists worked in the US for that firm, he says. They are affiliated with the Chinese Academy of Sciences, a government-backed entity, and have political connections. He says he felt a "duty" to come forward and hopes his story will help the White House craft a response. The office of the US Trade Representative, which is leading the inquiry, did not respond to requests for comment about the investigation. China maintains it has responded to concerns, pointing to laws that forbid intellectual property theft, success by western companies in Chinese courts, and its own efforts to address cyber crime. In September, after the Trump administration launched its investigation, it announced a four-month crackdown focused on intellectual property and foreign investors. In comments submitted to US investigators, Chinese organisations told the US that decisions to establish joint ventures and share technology are voluntary agreements between private companies. They cast government initiatives, such as Made in China 2025, as "promotional" - not mandatory - programmes. Some US businesses also defend China's approach. William Mansfield is the intellectual property director at Abro Industries, a 25-person company based in Indiana that makes products such as glue and tape for sale overseas. He says he has spent years fighting against counterfeiters in China - and has figured out successful ways of using China's system, like asking for help from local authorities instead of immediately pursuing a lawsuit. 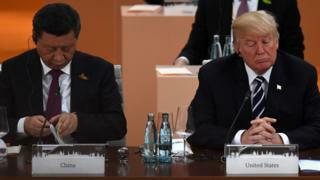 Image caption President Trump has reportedly told advisors he wants "tariffs"
He says US companies often don't understand how China works and unfairly blame problems on the government. "I've just never seen anything that would lead me to believe it's anything other than individual counterfeiters acting to maximise their profit and not really caring about the rules," he says. Many US analysts expect the White House to find fault with Beijing; pointing to the growing corporate involvement of the Communist Party and rules that require foreign companies in some sectors to use local partners. But it is unclear what the White House might do after that. The US could work with the Chinese government, collaborate with other countries to craft a response, bring a complaint in an international forum such as the World Trade Organisation, or take unilateral action. That risks triggering a trade war but President Trump - who has repeatedly attacked China while dismissing international pacts - may be more open to that approach, Mr Levy says. The White House China's strategy remains unclear as different advisors appear to promote clashing approaches, he adds. Investigation of Chinese steel companies, for example, has not led to action. The White House also wants Chinese cooperation as it responds to missile tests from North Korea. "It's hard to puzzle out what they're doing," Mr Levy says. US Commerce Secretary Wilbur Ross says he expects addressing the issue to take time. But he says the US is looking for immediate deals, like ones struck between Boeing and Saudi Arabia, as a sign of good faith. Many businesses remain worried the White House could damage the US relationship with China to satisfy isolationists among President Trump's supporters. Erin Ennis, of the US China Business Council, says about 20% of its members have faced pressure in China to transfer key technology in recent years, but adds that they also report that the environment in China is improving. She urges the administration to focus on specific changes in China, rather than simply imposing penalties, such as sanctions. For example, China could stop making a distinction between foreign and domestic companies, she says. Even without testimony from major companies, associations like hers have provided enough suggestions for the White House to work with the Chinese government, says Ms Ennis. But Prof Branstetter says the US will need to take stronger, more targeted action if it expects intellectual property thefts to stop. He says it doesn't have the information to do so now and he has doubts about this administration's abilities to craft an adroit response. "It's easy to see this going badly," he says.